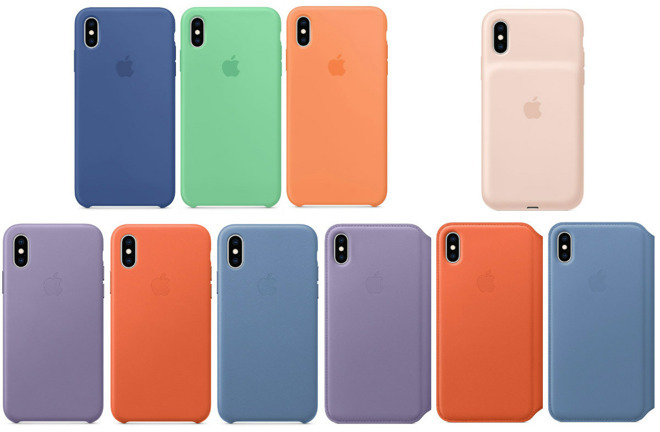 While updating the store today with the second generation AirPods, Apple also took the opportunity to refresh its offerings with new Spring colors of Apple Watch bands and iPhone cases. The new hues are all vivid and colorful to celebrate the impending arrival of warm weather in the U.S.
For the Apple Watch, Apple's Sport Band is newly available in Spearmint (green), Delft Blue, and Papaya (orange). The Nike Sport band has stylish new Black/Hyper Grape, Spruce Fog/Vintage Lichen, and Teal/Tropical Twist colorways. Leather Loop can now be picked up in Spruce Fog, Hyper Grape, Summit White, Teal Tint, and Black. The leather bands were updated too. Leather Loop is now available in Sunset and Cornflower while the modern buckle comes in Cornflower, Sunset, and Lilac. The Hermes Double Tour is also updated with several new colors. As new bands come in, old ones go out. Several older colorways have been discontinued to make room for the fresh styles. For iPhone, there is an updated version of the Smart Battery case for the XS in pink sand. Standard silicone cases now show up in Spearmint, Papaya, and Delft Blue. 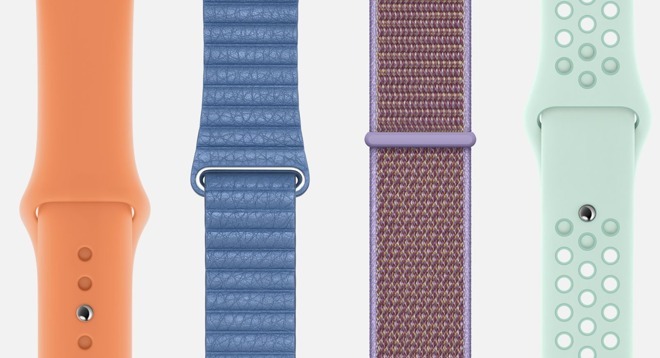 Leather cases too borrow from the Apple Watch bands coming in Cornflower, Sunset, and Lilac. The cases and bands are available through Apple now, before hitting other retailers and stores by next week. Finally the reflective black Nike band available separate! Finally! I've been waiting for that one to release. I'm a new apple watch user and my eyes went 😳 when I saw the cost of these. I'm assuming there's a decent third party market for apple watch bands out there? Anything I should be aware of before buying? What a product line improvement, Apple. Way to go. Double the price for this novelty because people need hype of owning Apple products. Apple's will always be expensive but nice. You can find 3rd party bands everywhere including Target, Walmart, Amazon, even Groupon. there are 2 sizes so make sure you get the one that matches yours. Amazon is full of 3rd party bands. You can find a Milanese Loop knockoff for like $10, but it’s not going to be as nice as Apple’s at $150. But at that cheap, you can buy one for an event and throw it out after. If you don’t like something, you don’t need to buy it... or even concern yourself with it. No doubt. I blocked him, but doesnt that guy ever get tired of trolling stuff he doesn't intend on buying? I've had first-party bands and third-party. Some are better, some are worse. I've never bought an Apple accessory because of some pretend hype making me do so. Listen stop trolling. If you are Apple’s new best critic go do it over at the WSJ or something. And also don’t buy the darn things. Geez. I'm a new apple watch user and my eyes went ߘ㠷hen I saw the cost of these.